Scared of leaving pets home alone? You aren’t the only one. Many people are concerned when it comes to leaving their house without their beloved pets in tow. Since going out sans pets is an annoying reality of life, let’s try to identify why we have these fears and what we might be able to do to help alleviate them. Yeah, I went there. Two of the most terrifying things that can happen to a home are two of the thoughts that enter my brain when I know I have to go somewhere. Both cases involve scenarios that depend on the animals’ reactions. Will they run out the door? Will they cower and hide? I recommend installing security that will alert your smartphone should anyone break in. Most security systems have fire alarm protection as an option, as well. We have regular smoke alarms and then a few from ADT. If either ADT alarm is triggered, a text goes out to me, my husband, and my sister. Between the three of us, we can react quickly to call 911 and then get someone over there to tend to the animals. Place a sign on your house to make it clear you have pets. Should responders need to get into your house when you aren’t there, a sign can let them know that living creatures are inside. I hate leaving my animals because I know they might be afraid. Clingy much? Yeah, I know. But, if there are fireworks or a storm, I have one dog who becomes paralyzed with fear. I empathize with him since I have so many of my own life-ruling fears. Thanks to technology, there are now pet monitors that allow you to see your pets and speak to them. Heck, some devices will even dispense treats. So, if you’re at work during a thunderstorm and it’s ripping you up knowing that your furry friend is frightened, shoot him a treat and some soothing sounds. If the two humans of this household leave the animals, I worry about us not returning. What if we get into a horrible accident and are both hospitalized? People we talk with frequently would realize it eventually, but what about the animals in the interim? Thanks to social media, my close friends and family usually know when we are out. We never leave the animals alone for more than a few hours. If we both need to be away for a longer period, we make arrangements for someone to come check on the pets. Keep emergency cards in your wallet. You should already have some with your blood type, current medications, and other important medical history. Makes sense to have one that alerts people that you have pets home alone. Leaving pets home alone shouldn’t be this much of a concern. Yes, we hate to leave them, but there are resources to help make it a less stressful event. 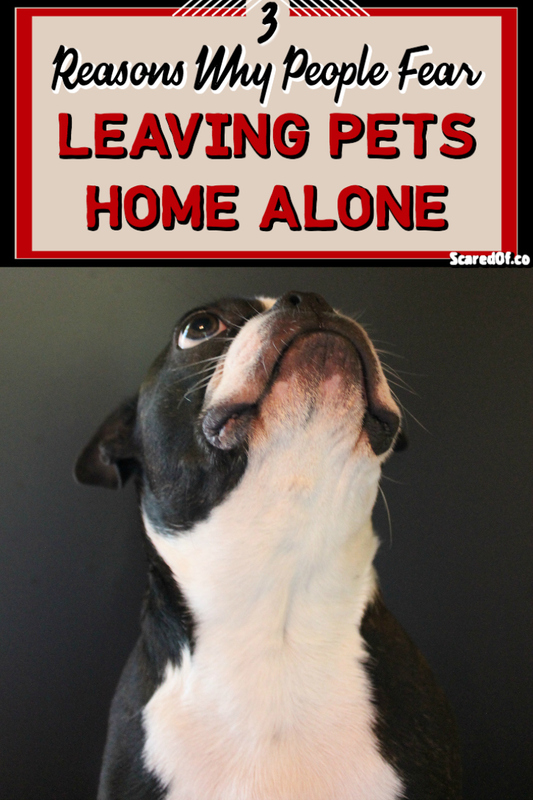 Do you have a fear of leaving pets home alone? What do you do to help make it easier? Since our little family experienced a bombardment of life changing happenings…my strong healthy husband discovered he had a potentially terminal cancer 55 yrs, one of our poodle dogs died 10yrs from a previously undiagnosed cancer and again within six months of my hubby’s diagnosis a second toy poodle dog 9yrs died of another cancer. We also had our life savings scammed from us and then a third dog died from a blood cancer (the last of our three original dogs) at 8 yrs of age. As I write this my stomach and mind is in turmoil and I battle tears. My present oldest dog is 8 years old (also a toy poodle) & I can’t stress enough how much my life is bound up in her. We also have a 2 yr old poodle cross. I can’t get over how quickly they were taken! I’ve never fed my dogs tinned pet food only freshly coked meat and veg backed up with good quality dry food. I had no expectations they’d die so young. Now, I just feel as though I must keep control of anything in my care. The world turned bad and I needed to avoid it. I cannot bring myself to go out without them since. In fact, I’m avoiding taking them out so in turn when we go out in the car my oldest goes into a panic meltdown until she senses we’re turned homeward. On top of all of this I do have a diagnosed painful illness. Guilt, sadness, grief haunt me. It’s just easier to not go out. Help! Oh my goodness, Amanda. No one should have to go through that much! I am so sorry to hear about your ongoing struggles. I really hope you catch a break soon. I understand the feelings you have now… although on a smaller scale, several life events made me want to stay in more and more. I wish I had advice, but all I can say is to take care of you. My heart goes out to you and I’m sending all my positive thoughts and vibes. I wish I had more helpful words!